Hi-Tech offers Computational Fluid Dynamics (CFD) analysis services for performance prediction of nozzle and atomizer designs by analyzing the airflow, droplet trajectories, pressure changes and fluid density to achieve requited spray performance. Our solutions address vital challenges associated with design optimization of nozzles and atomizers applied in process industries without actual testing, thereby avoiding the high risk of fire explosions and chemical reactions. Nozzles and atomizers have the prime responsibility to deliver high-velocity atomized spray jets, requiring high level design accuracy. 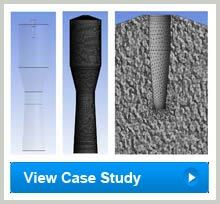 Based on our domain expertise, we offer CFD simulations to ensure error-free solutions that can be employed for design modifications.